T-ball, we’ve decided, is much more his speed. Basketball was fun, but it didn’t allow for the gaps in attention span found naturally in this particular five year old. He would lose interest for a few seconds and the game was already at the other end of the court, just like that. T-ball, on the other hand, is a little slower. It allows him to zone out, inspect the dirt, come back, and he hasn’t missed much. Well — and you get dirty. That’s always a plus. 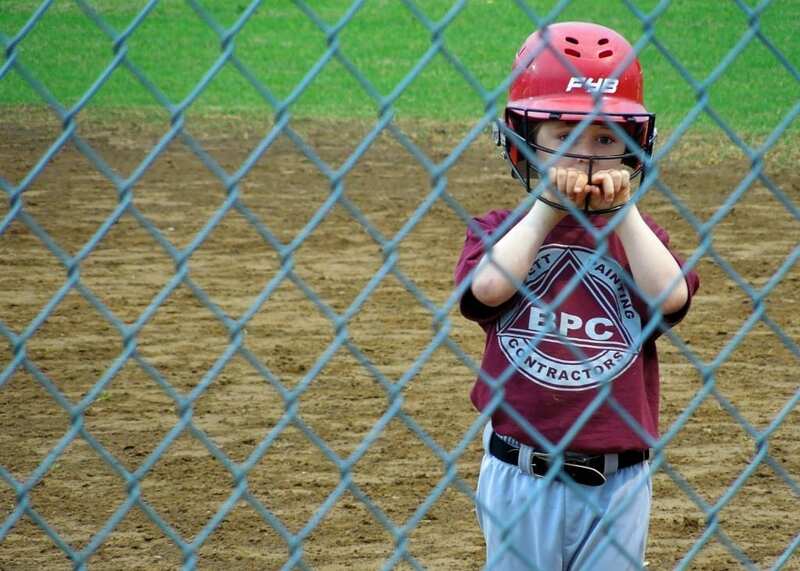 Over the course of the season, we’ve developed three rules for t-ball in this house, and we quiz him often. Pre-game, post-game, during practice in the front yard. Rule #3: Don’t play in the dirt. Rule #3 is a work in progress. Who woulda thought so much premium entertainment could be observed through a chain link fence? Oh my, that boy – the picture of the bent over, up-close inspection of the dirt is absolutely priceless!! Oh and also, I have missed your last couple of updates because of my change in emails – remedied!!! !